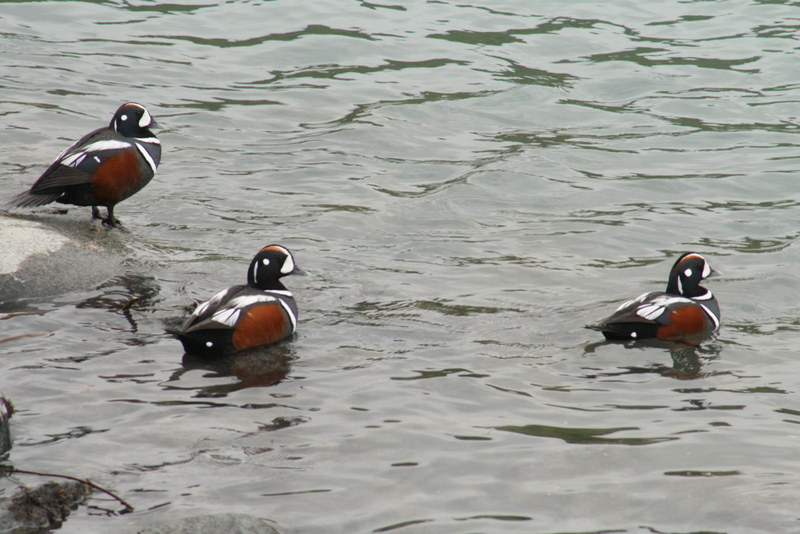 These are called “Harlequin Ducks” and they are just the coolest looking ducks I have ever seen. Never saw 1 before coming to Cooper Landing,AK. The last time I walked down to road to where this picture was taken I didn’t see any ducks and the rocks where they were sitting was all covered by water…obviously the water-level in the river had rose up. It was fun to watch them dive under the water for food and then try to guess where they would pop back up to the surface again. Once they were back up, they would float along down the river…always to about the same area and then the would fly back upstream to do it all over again. I will also miss the midnight sun. Now even before I came up here, people would ask me how I would get used to that. Ha, for someone who could fall asleep with their light on having a midnight sun was no big deal. Actually it was quite nice to be able to walk around without having to worry about walking into something in the dark. Now I love the sunsets at the Grand Canyon and I have missed those since I came up here, but it always gets so dark after a sunset. Guess in order to have the sunset I gotta except the darkness that follows. Well today seems to be a cloudy/gloomy day outside. I can hear jeff working in the bathrooms. Wonder if they will actually get done before I leave. We now have a few kids from China here…when I first saw Asian students working in Anchorage, I thought it was so wierd that the kids would apply for jobs at fast food restaurants in Alaska. Oh Well, when I get back to the Grand canyon I will have lots of Asian co-workers again. Length Of Visible Light: 23h 25m. Length of Day: 19h 03m. Tomorrow will be 0m 6s longer. Tomorrow’s the First day of Summer and Summer Solstice is Thursday!